1. 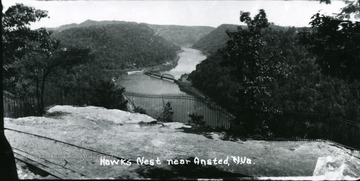 Hawk's Nest, Fayette County, W. Va.
Hawk's Nest, Fayette County, W. Va.
View of Hawks Nest near Ansted. 2. 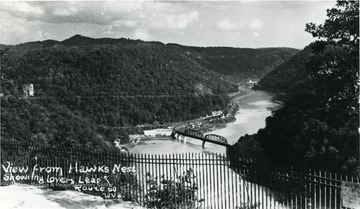 Hawk's Nest Dam, Fayette County, W. Va.
Hawk's Nest Dam, Fayette County, W. Va.
View of Hawk's Nest Dam from Lover's Leap near Ansted on Route 60. 3. 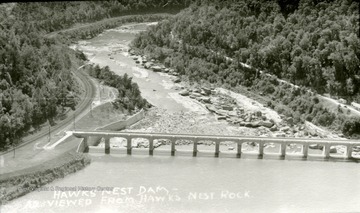 Hawk's Nest Dam, Fayette County, W. Va.
Hawk's Nest Dam as viewed from Hawks Nest Rock. 4. 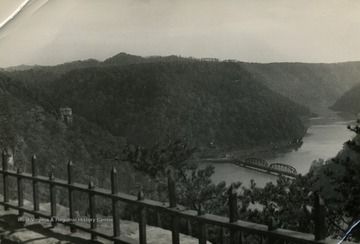 View of Lover's Leap from Hawk's Nest, Fayette County, W. Va.
View of Lover's Leap from Hawk's Nest, Fayette County, W. Va.
View from Hawk's Nest showing Lover's Leap on Route 60. 5. Hawk's Nest Dam Viewed from Lover's Leap in Fayette County, W. Va.
Hawk's Nest Dam Viewed from Lover's Leap in Fayette County, W. Va.
6. 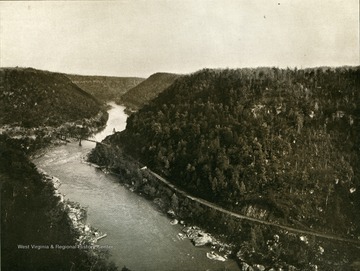 Hawk's Nest Rock and New River Canyon, Fayette County, W. Va.
Hawk's Nest Rock and New River Canyon, Fayette County, W. Va.
People looking at the aerial view of Hawk's Nest Rock and New River Canyon. 7. 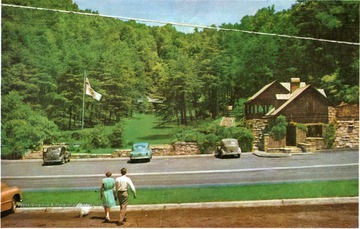 Hawk's Nest State Park, Fayette County, W. Va.
Hawk's Nest State Park, Fayette County, W. Va.
Pictured is the parking area and view of Hawk's Nest State Park on U.S. Route 60, Fayette County. From this station you can see the famous New River Canyon which is visited by thousands of persons each year. 8. 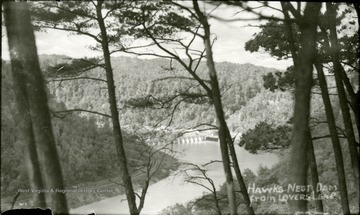 Looking East from Hawk's Nest, Chesapeake and Ohio Railroad, Fayette County, W. Va. 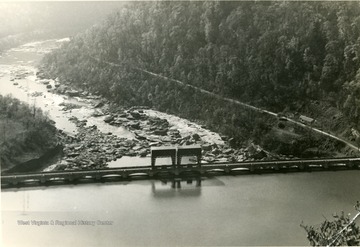 Looking East from Hawk's Nest, Chesapeake and Ohio Railroad, Fayette County, W. Va.
9. 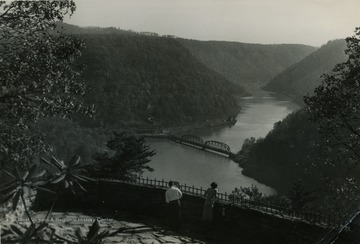 View of the New River and Bridge from Hawk's Nest, Fayette County, W. Va.
View of the New River and Bridge from Hawk's Nest, Fayette County, W. Va.
10. 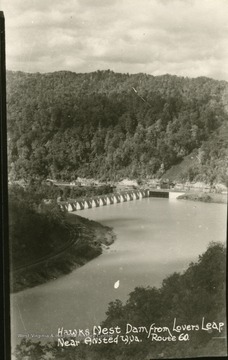 View of Dam and Reservoir from Hawk's Nest, Fayette County, W. Va.
View of Dam and Reservoir from Hawk's Nest, Fayette County, W. Va.
11. 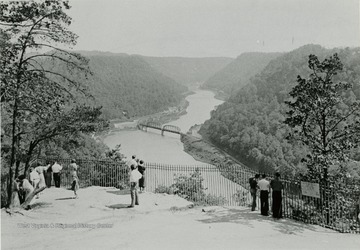 View from Hawk's Nest, Fayette County, W. Va.
View from Hawk's Nest, Fayette County, W. Va.
People enjoying the scenic view of the mountains and the river from Hawk's Nest in Fayette County. 12. 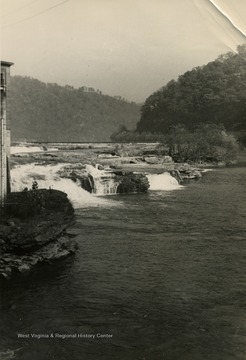 Hawk's Nest, Fayette County, W. Va.
A view of the New River and rapids from Hawk's Nest in Fayette County.